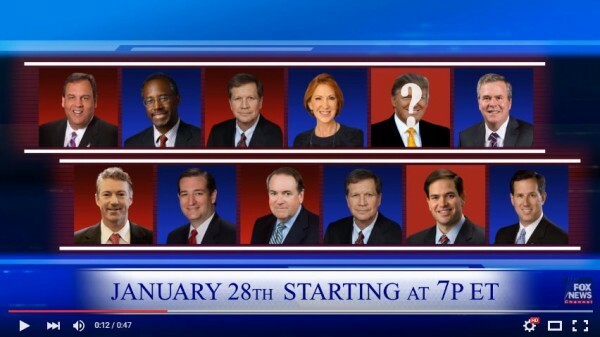 Fox News and Google have teamed up to present the 7th Republican Debate on Thursday, January 28th starting at 7 p.m. Eastern Time. The debate is the last before the Iowa Caucuses on February 1st. The co-sponsored event will include an extension of the debate to Google, where candidates and viewers alike can watch and comment in real time. The debate can be found by searching for the phrase “fox news debate” on Google through desktop browsers and mobile apps. Users will also be able to vote on issues through the interactive website and app. What’s been controversial, however, is whether or not Donald Trump will attend the debate. He has an ongoing feud going with Fox News anchor Megyn Kelly who has questioned his positions and statements about women. For several days Trump tried to petition to have Kelly removed from the debate, but Fox News is taking a stand against the GOP frontrunner. “We can’t give into terrorizations toward any of our employees,” said the network. “I’m not going to do the debate. I’m going to have something else in Iowa,” Trump said yesterday. Trump may change his mind at the last second, and would surely be welcomed by Fox to Thursday night’s debate given his ability to increase ratings. Regardless of Trump’s decision, the 7th Republican Debate will be hosted by Kelly along with Chris Wallace and Bret Baier. The debate will also include online questions from YouTube content creators Dulce Candy, Mark Watson, and Nabela Noor. Check out the Fox News promo below. I am very disappointed in The Republican Party, Fox News, Megan Kelly, and with Google for being a part of this ridiculous personal attack on Donald Trump. Let him be, stick to the important issues like Immigration, Security, Terrorism, Economy, Education, and so many more. We the people will decide on who we vote for, it is not the business of the Media, Google, or a popularity contest. If you continue to bash Trump and let Bush attack, or others attack Cruz or Rubio, I will have no choice but to leave the Republican Party, after 50 years of support. Stop bashing Trump, stick to the issues, or I find a new party and News Station. Because of Megan Kelly, The programmed agenda by Fox to bring Trump down, and the resistance by the RNC not to accept the people’s choice, I refuse to watch the debate, and will not contribute one thin dime to the RNC…most of Kentucky feels the same.